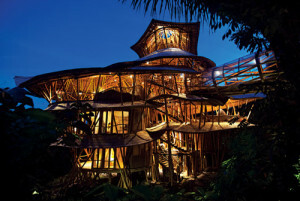 For bamboo buildings on a grand scale, Bali is already famous for the Green School. Near the Green School is Green Village. The photo here is one example of the hand-constructed homes built of bamboo with outstanding attention to detail. Follow the link for some breathtaking photos on the Green Village website. Jamaica is looking to resuscitate the bamboo industry. With approximately 106,000 acres of bamboo, Jamaica is one of 38 countries with commercially viable stocks of bamboo that are members of the International Network for Bamboo and Rattan (INBAR). The INBAR website is a good source of information for anyone with more than a passing interest in bamboo. If you find yourself in Jamaica, you might enjoy a river trip on a bamboo raft. 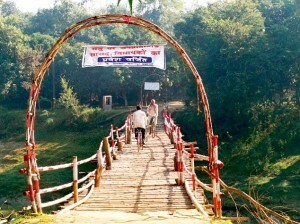 The residents of remote village in Bihar, India, have built their own makeshift bamboo bridge after waiting since 1985 for the government to build a concrete bridge for them. Elected members are barred from using the bridge. Most bamboo flowers and seeds rarely. In the south of Burma, the unusual event is being blamed for expected food shortages. Villagers say that when bamboo flowers and produces seed it attracts swarms of rats. The sudden proliferation of food causes the rats to multiply rapidly. When the bamboo seeds are depleted, the rats then consume the villagers’ rice crops. 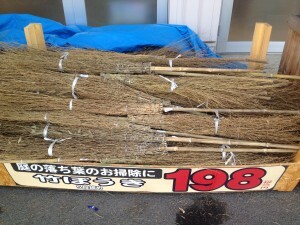 As autumn approaches in the northern hemisphere, Weather Girl laments the ubiquitous leaf blower and expounds the virtues of the humble bamboo rake , and ex-pat Chris has visions of Harry Potter when he uses his bamboo broom in Tokyo. Bamboo toothbrushes: environmentally friendly oral hygiene wrapped in feel-good social entrepreneurship – except for the nylon bristles. What I’d like is bamboo toothbrush with natural bristles. Bamboo coffins: A local NGO in Mizoram, India, which helps in coordinating social functions and conducting funerals for poor families, have been providing free bamboo coffins to those who cannot afford the wooden ones. This entry was posted in All, Bamboo around the world, Bamboo on the Internet, Building and Home Renovation and tagged architecture, bamboo, brooms, Burma, coffins, India, Jamaica, rafting, rakes, toothbrushes on 01/12/2013 by Deb.